Meat hygiene inspectors, vets and support staff took two days of strike action last week in a long-running dispute over pay. They staged two four-hour walkouts from 6.30am-10.30am on Tuesday, August 26, and again on Wednesday, August 27. This follows a ballot earlier this month, which saw UNISON’s Food Standards Agency (FSA) members overwhelmingly vote for strike action over an imposed pay offer of just 0.75%, while most other public service workers have been offered a 1% increase. 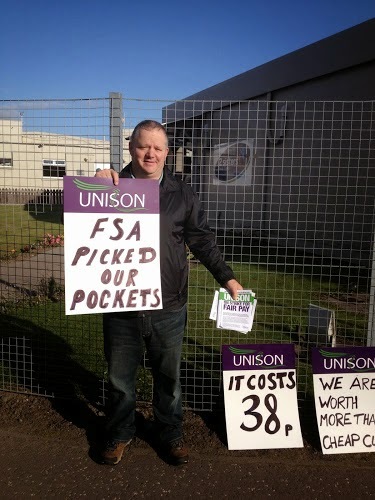 UNISON has previously invited the FSA to resolve the pay dispute through independent conciliation. 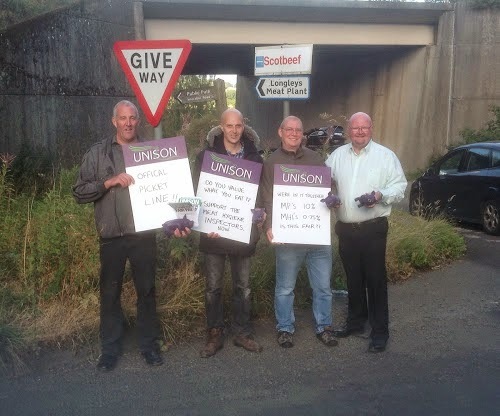 Even as late as last week, UNISON asked them to reconsider and go to ACAS for arbitration, but they refused. Kate Ramsden, Branch Chair said: “Our Branch is one which hosts members in the Food Standards Agency Sector. We stand fully behind our members’ action. “There was a good response too from farmers and others at the meat inspectors’ picket line at the Scotbeef plant in Bridge of Allen. Like us they recognise how important out meat inspection team is to public health. “Meat inspectors, official veterinarians and support staff cost each person in the country just 38 pence per year. When you consider that since April 2012, they have prevented over a million instances of diseased animal carcasses from entering the food chain, it’s a small price to pay for safer food. “Staff in slaughterhouses work in some of the most dirty, difficult and stressful conditions, surrounded by blood and faeces, to keep the public safe from contaminated meat.